FREE! 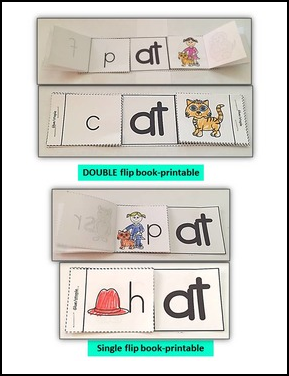 This package offers short a- -AT FAMILY WORDS, NO PREP FOLDABLE BOOK, CUT/PASTE BOOKS, SINGLE AND DOUBLE FLIP BOOKS AND WORKSHEETS. THIS IS A FREE SAMPLE PACKS FOR MY NO PREP SHORT VOWEL FAMILY WORD PACKS. There are two version of this printable book. In one, the students cut and paste to build to FULL WORD. In the other, the students cut and paste ONLY THE BEGINNING LETTER. There are two flipbooks offered. 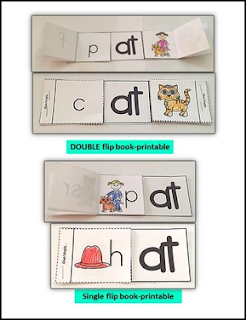 One is a single flip book where the word and the letter appear on the left side of the book- as students flip the pages, it spells the words. The second is a DOUBLE flip book. On the left side is the letter and on the right side is the picture. Students flip the letter and picture to match and build the word. In addition to the above tools, there are 10 extra no prep worksheets that you can use for homework, centers, or extra practice/support. Worksheets vary from package to package but offer a variety of experiences such as color or dab the words, spin or roll, fill in missing sounds to spell the word, write the full word, etc.. PLEASE SEE THE PREVIEW TO VIEW THE SPECIFIC WORKSHEETS IN THIS PACKAGE.